Does GroupMail have email contact management tools to make it easy to manage my email contacts? Yes, GroupMail’s email contact management tools are found in your groups menu, and include everything you need to create new groups, manually add contacts to a group, modify contact details, import contacts, export contacts, merge contact groups, purge contact groups or search for contacts. Just select the contact management feature that you need from the navigation panel on the left-hand side of the screen. 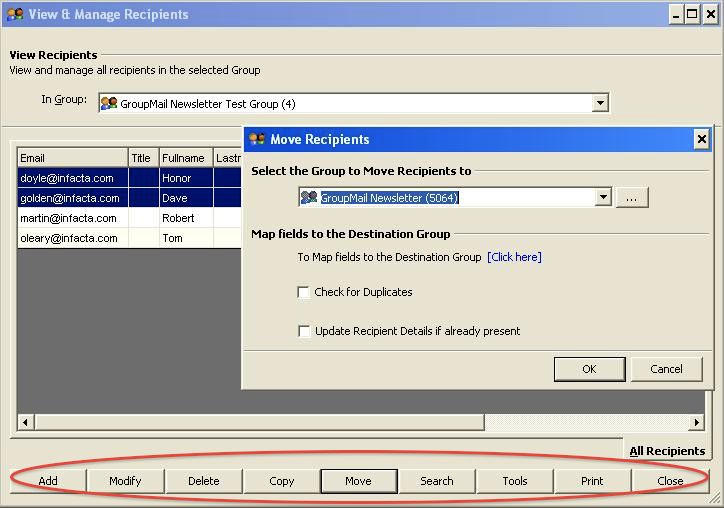 You can easily manage contacts within a group by opening the group and working within the View and Manage Recipients screen. In this area, you can add new contacts, modify contacts, delete contacts, move contacts to another group, copy contacts to other groups, search for contacts and print your contact lists. Business edition customers can also share contacts on a network folder and link GroupMail to contacts in other contact management applications such as Outlook, Excel, Access, SQL, MySQL, ACT! and more.